One year ago, IGERT Cohort #2 was all decked out in hazmat suits atop the Greenland Icesheet digging snowpits to sample for radiation from the Fukushima Daiichi nuclear meltdown caused by the 2011 Great Tohoku Earthquake and the following tsunami; this weekend I got to experience the damage first hand while visiting Sendai, Japan, one the of the hardest hit areas in the country. On March 11, 2011 at 14:46 JST a 9.0 earthquake, one of the largest 5 earthquakes every recorded, struck off the east coast of Japan. Not only did the ground shake for “almost 20 minutes”, but a tsunami 30 m tall in places, struck much of the eastern coast. The combination of mother natures sheer strength caused for a whole host of destruction – from the Fukushima Daiichi nuclear power plant meltdown and the ensuing spewing of radioactivity onto both the land and the sea (quick note of interest – the plant is still leaking radioactive water into the ocean over one year later!) to the destruction of whole neighborhoods, factories, farmlands, and fishing communities. 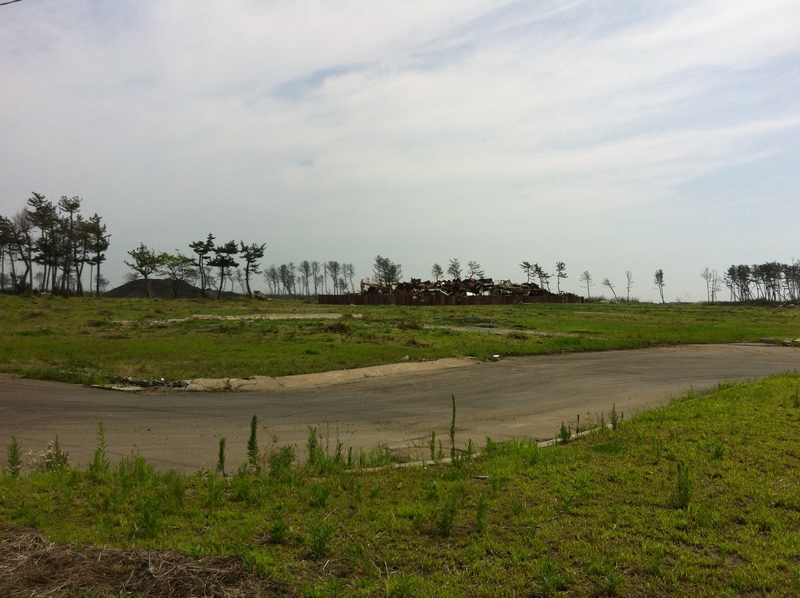 The former site of a neighborhood near the Sendai airport. All that remains are piles of metal, wood, etc., foundations, a few sturdy houses, a graveyard that has been rebuilt, and one man rebuilding his world (see next picture). 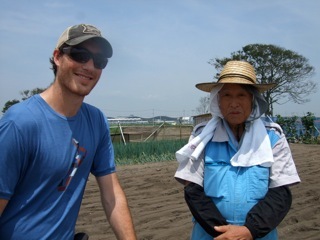 Anne (my girlfriends godmother and trusted tour guide and new friend) and I found this gentle man tilling his garden, that had once been the site of his families house. His family had lived there for 6 generations. He was humble and grateful for our interest. While the destruction that was caused was so great and widespread, the people of Japan have kept their spirits high. They offer great insights into what resiliency looks like – it looks like loosing everything, yet remaining calm, standing in line and not shouting and shoving for the few pieces of food you may get from the shop. It looks like getting into the shop and rather than taking lots, leaving enough so that everybody else can have a little too. It looks like returning to your land to start anew like the man above. It looks like picking up the pieces and slowly and diligently putting them back together. This weekend has rekindled my fire to continue fighting for what is good in this world, for justice for those who cannot fight, and to be kind, generous, and treat everyone with respect. It has also reminded me how grateful I am to be alive, have a wonderful family, and the best friends in the world. A little over one year later, things are slowly returning to normal. 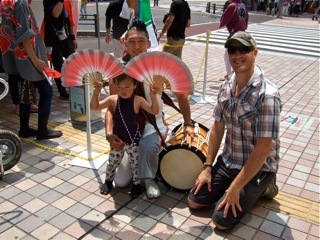 Today was the start of festival – this little boy and his father tore it up dancing, flying those fans, and playing the drum.